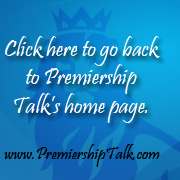 As the Premiership Talk Forum continues to grow at a slow but steady pace, today we are pleased to announce two improvements/additions to the forum. The most relevant addition to the forum is the new reputation system. While our members have been competing based on post counts for some time now, the addition of the reputation system should add more excitement and competitiveness amongst fans. Instead of being rewarded simply based on quantity, the forum will now reward members for quality posts. Each reputation point is defined as a "goal" in the forum. Members give goals to fellow posters to reward good or helpful posts. Additionally, if there is an inflammatory or bad post, members can take goals away from the poster. From time to time the leading goalscorers on the forum will be entered into exclusive competitions as well as other benefits. To give out goals (or take them away), simply use the + and - buttons next to the post that you are referencing. As expected, a + will reward the poster with a goal while clicking - will take a goal away. To keep the integrity of these goals, members will be limited to giving out/taking away 10 goals a day. Any votes placed past your limit of 10 in one day will not count. With the forum's growth comes some of the less attractive side-effects. One of the problems that we have faced in the past few weeks has been excessive spammers, links, and off topic posts. While we do our best to moderate and/or remove these posts, we cannot play the role of the police all of the time. We appreciate your feedback on these improvements, and, as always, suggestions for future improvements. See you in the forums! I can't wait to score my first hat-trick! And yes, spammers are extremely annoying, so please help to get rid of them! Great idea Andy! That is actually in the works. You beat us to the surprise haha. In regards to finding out what you got goals for: All you have to do is look for a green bar on the right side of your post. That means that you got a goal for that post. If the bar is partly red or all red than it means that someone took a goal away from your post (i.e. they didn't like it). Oooh, my bad. I just realized what Andy's on about. Andy - during testing of this feature I inserted a "goal" button on each post that was coded wrong and resulted in the poster getting three "goals." One of your posts happened to be the first one I saw, so you were the one and only recipient of a coveted hat trick. haha. So consider that a testing error - that's the only reason you won't be able to find any greenies next to your posts. As for the red one - that was me as well, and also by accident during testing. I've been away for a while; come back to find the PremiershipTalk homepage has been replaced by the SkySports homepage, what happened guys! ?